I knew Cara online for years before we ever met in person. We were both involved in the same online community and interacted frequently. I finally had the opportunity to meet her on a weekend trip to Minneapolis a few years ago. We continued chatting on line and talked about camping and festivals and realized that we approached the subject similarly. Matt and I decided to attend a week long camping festival and camp with Cara and her friends (who are now our friends). It was really easy to see how much she loved what she was doing - especially when it came to entertaining. Each day featured 2pm cocktails and a community dinner at night. We even hosted a gourmet 7 course meal one evening for 12 people. It was fabulous. Now we take the time to make at least one camping trip with Cara and our friends each year. This is why I wasn't surprised at all when I learned about her plans to write a book on glamping. After a successful Kickstarter campaign, the book was finally under way. 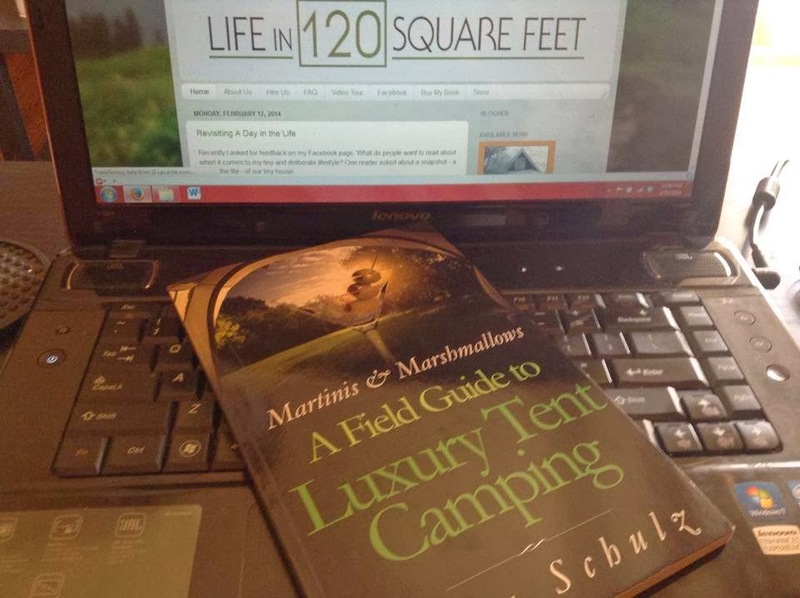 Martinis and Marshmallows: A Field Guide to Luxury Tent Camping is now available through Amazon and I just received my copy last week. I believe some luxury tent camping techniques and gear can be translated to tiny house living. It can make an excellent and inexpensive hobby/vacation for tiny house dwellers. The book is divided into 4 sections, each with its own theme. The design and photos are excellent and well worth the price of admission. I just want to share a few of my favorite things from the book. 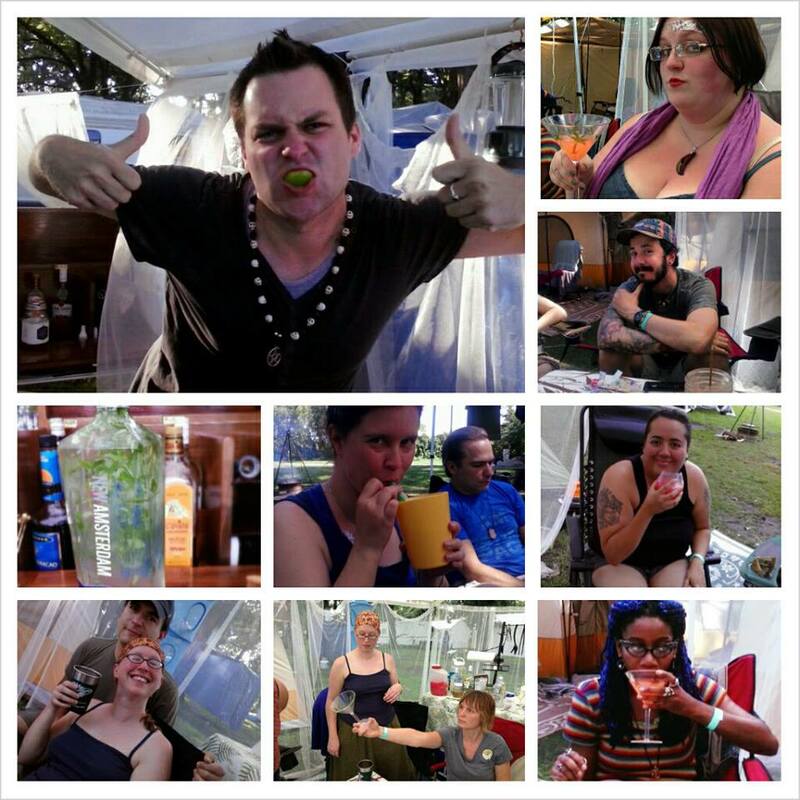 A collage of cocktail hour from our last trip. The second chapter - The Modern Minimalist - offers some great tips for those of us who want to camp in luxury but don't want to store a ton of camping gear. And, some of the suggestions such as battery operated fans and the BioLite stove are great accessories for off-grid living. Check out the glamping scouts idea - trust me, this was fun to do in real life. I was there! I absolutely adore some of the products in the 3rd chapter, especially the wrought iron shave and washstand. And the DIY icebox could be a great addition for tiny homes that currently function without refrigeration. There are also a lot of amazing camping recipes in the book which can easily be adapted to a tiny house kitchen or outdoor cooking space. Cara's book provides great insight into the art of tent camping and makes it accessible for everyone. If you're interested in learning more I recommend buying the book today and following Cara's blog! You can also follow the Facebook page and join in the conversation. wow.. what a nice luxury tent camp. I like this post so much and i want to appreciate to you for this. Good post. I learn something totally new and challenging on blogs I stumble upon on a daily basis. It will always be exciting to read through content from other writers and use something from their websites. Looks interesting! I wrote something about glamping for my husband's blog that makes me think of this; he totally doesn't get it. Sigh. Thank's for post. Wonderful! I've been reading you with such pleasure for quite a while now, and the fact that we were camping at Backwoods, enjoying a fantastic vacation at the same time you did pushed me to finally comment. With a trailer-tent, we no longer go to Seawall, but I sure miss those wonderful walk-in tent sites. Summer vacations are made for camping, definitely!